The Illusion of Asian Success – Scant Progress for Minorities in Cracking the Glass Ceiling from 2007-2015 analyzes the aggregate EEOC tech workforce 2007-2015 data for Asians, Hispanics and Blacks in the San Francisco Bay Area and finds scant progress in improving upward management mobility for minority men and women with key findings: 1. Race was a more significant factor than gender as an impediment to climbing the management ladder. 2. Asians were the most likely to be hired, but least likely to be promoted. 3. Blacks and the Hispanics declined in their representation of the professional workforce. Generally lost in the national narrative about corporate diversity is a discussion of the issues facing Asian Americans. Lost In Aggregation: The Asian Reflection in the Glass Ceiling report takes a closer analysis of U.S. Equal Employment Opportunity Commission (EEOC) workplace data sets disaggregated by race and gender and finds that professional Asian American men and women are the least likely to become executives in private industry. Authored by Buck Gee and Janet Wong, both seasoned business executives and active Ascend executive advisors. Hidden in Plain Sight: Asian American Leaders in Silicon Valley analyzes the leadership pipeline using the 2013 employment data filed with the U.S. Equal Employment Opportunity Commission (EEOC) by five major Silicon Valley-based companies. The study reveals some surprising results including that the glass ceiling is 3.7x times harder for Asian Americans to crack and gives access to our Executive Parity Index (EPI) calculator tool which will allow any company to determine their EPI score. Authored by Buck Gee, Denise Peck, and Janet Wong, all seasoned business executives and active Ascend executive advisors. 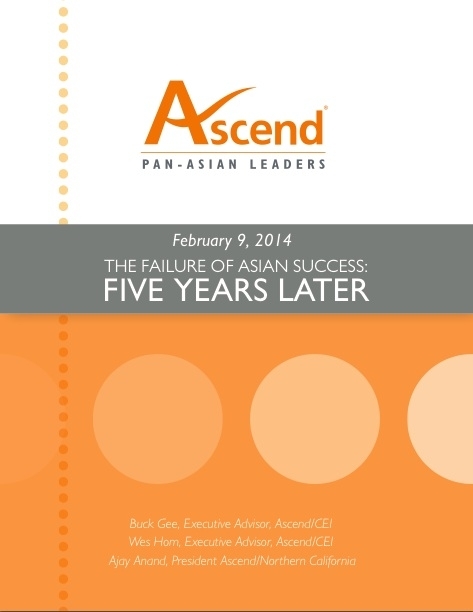 The Failure of Asian Success - Five Years Later, written in 2014, dissects the reasons why the number of Asian American executives in the Bay Area Fortune 500 companies continues to lag their growing presence in the professional workforce and overall population. Having spent well over 1,000 hours since 2009 teaching and mentoring aspiring Asian managers, the authors are convinced that underdeveloped leadership skills is the factor that hinders access to executive leadership levels for many of them. 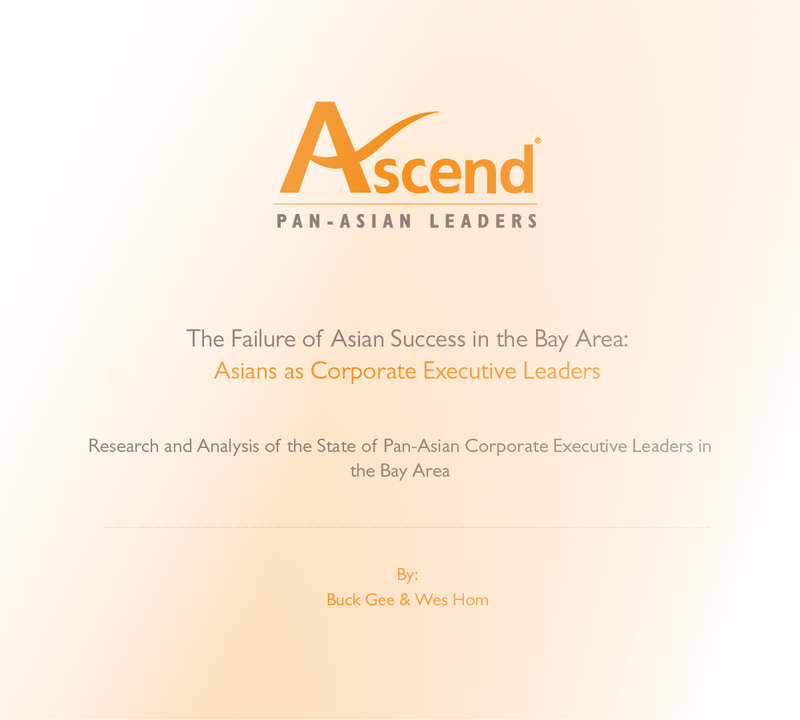 The Failure of Asian Success in the Bay Area: Asians as Corporate Executive Leaders - Research and Analysis of the State of Pan-Asian Corporate Executive Leaders in the Bay Area, written in 2009, presents research and analysis on the tightly constricted executive pipeline for Asian employees in the Bay Area which consists of a large base of Asian employees but a small segment of executive management. This is a reality widely known by the Asian workforce, but hidden in plain sight to corporate management. This perception gap is the heart of a problem that has persisted for decades, and indicates a failure of leadership within the Bay Area executive community, especially within the Asian executive community. 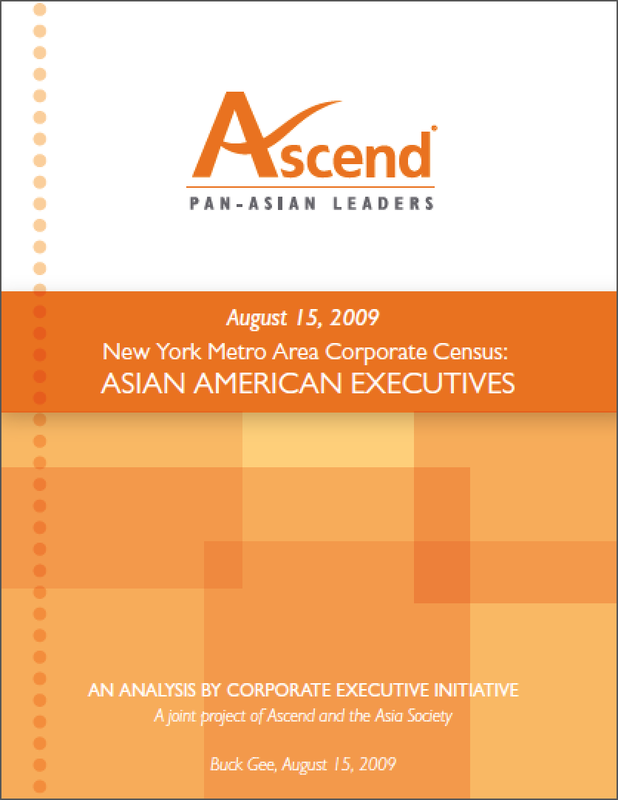 This joint analysis by Ascend and the Asia Society surveys the largest Fortune‐1000 corporations with headquarters located in the New York City tri‐state (NY/NJ/CT) metropolitan area to assess Asian American success in reaching the highest corporate executive levels. The Everest Project, a global research initiative in partnership with the Ascend Foundation, Executive Leadership Council (ELC), Hispanic Association on Corporate Responsibility (HACR), and Out Leadership is the first theoretical and practical research initiative to take a multicultural and gender specific perspective in examining the role of women executives in corporate America. Eve of Change: Women Redefining Corporate America examines the influence of women’s leadership in today’s global economy and provides insight into how the intersection of gender, race, ethnicity, culture, and sexual orientation impacts women in the workplace. The full report is available online at www.everestproject.org. For more information on the Ascend Foundation, please visit www.ascendleadership.org/foundation.